An agency has confessed to setting up the @official_Rule40 account, a parody Twitter account which tweeted to anyone using official Olympics hashtags on Twitter. Dublin agency eightytwenty’s head of social and content, Michael Corcoran, outed himself and admits that he expected Twitter to shut the account, and knew he was infringing IOC rules by borrowing the Rio 2016 logo. 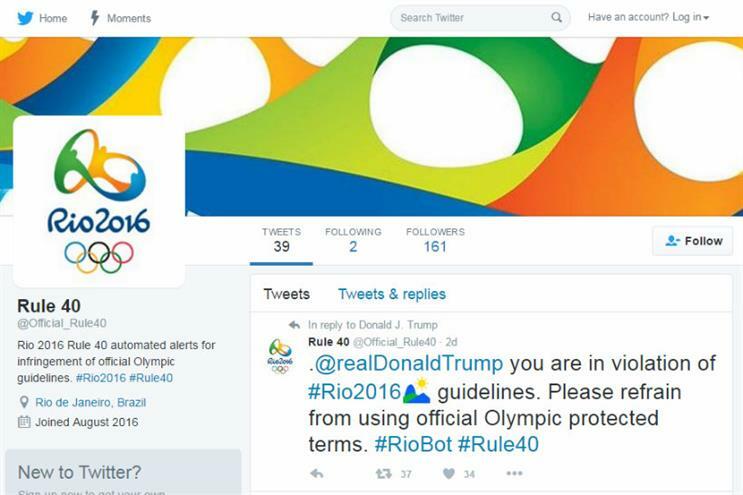 The account automatically tweeted to users who tweeted with official hashtags such as #Rio2016, telling them: "You are in violation of #Rio2016 guidelines". It tweeted to the Pope, Number 10 and Donald Trump, among many others, and garnered much attention despite clearly being fake. "This was by no means heavily planned and tactics were agile, I spotted an opportunity and I rode the wave," said Corcoran. "I fully expected to be shut down quickly, ironically I was infringing on International Olympic Committee copyright using the official logo while creating RioBot, but that was key to the execution at first glance to make it look authentic." Corcoran’s intention was to highlight the frustration felt by "many" agencies and brands at Rule 40, which prevents non-sponsors from hijacking the event with their own marketing. He said: "Rule 40 has caused frustration for many (including myself) working within the industry, facing missed opportunities for brands to activate around the games. "I always enjoy a creative challenge, but no mention of medals, podiums, sports, summer, any of the countries, team or athletes has made it nigh on impossible to create compelling work." He added that the rule was unfair to athletes, who are denied revenue from non-Olympics sponsorships.